Take your stove, Dutch oven, or solar oven (or all of them) and plan menus for each cooking method. You may want to choose some canned foods that can be quickly heated on a propane stove. Or try some freeze dried foods in your solar oven. For instance, for breakfast, try scrambled eggs using powdered eggs, bacon bits, and freeze dried cheese. Or for dinner you might want to throw some meat, veggies, potatoes, and your favorite sauce into a pan and put it into the solar oven. Now go hiking — all day if you like — and your dinner will be ready when you return. Practice your fire building skills. If a crisis ever developed where escaping into the wild would be necessary, would you know how to build a fire? What is a well-built fire? What kind would you need for cooking? What about a slow burning fire to last the night to keep wild animals away? Do you know when to use a teepee fire? A lean-to fire? What if you only have wet wood? Or there's snow on the ground? Take your water purifying or filtering equipment and use it exclusively for, at least your drinking water, or if you're serious about this, for ALL the water for cooking and drinking. You'll learn how to put the filter together (if needed), how much water it can filter and how fast, and if it will be a sufficient amount for the number of people in your family. You'll soon know if you need more than one or if, what you have, works for you. What about shelter? (Taking a camper or motorhome is cheating.) Do you have a tent? Do you know how to assemble it? Tie it down in case of high winds? Trench it in case of heavy rains? And what about those inexpensive tents that come in little packages for your 72-hour emergency kit? There are two kinds: the Insulated aluminum coated tube tent and the 2-person tube tent. Are they worth the money? Since they are so inexpensive, break one out and test it. What about an inexpensive solar shower? We have two. They will heat 5 gallons of water to about 100 degrees in a couple of hours. Sure feels good when you're out in the wilds surrounded by dirt to take a quick, warm shower. Don't forget plenty of lights. Flashlights, of course, but you can't hold a flashlight and cook at the same time. So take into consideration what's appropriate for each situation. Consider a hanging lantern for the tent and maybe several for the cooking area. There are candles that burn liquid paraffin (smokeless and odorless) and burn for 100 hours that would give a nice glow in the evening. What about an energy source? Here's the really fun test! Why not set up a solar energy system and use it exclusively to play some music, light up your campsite, even watch a small TV if you like. 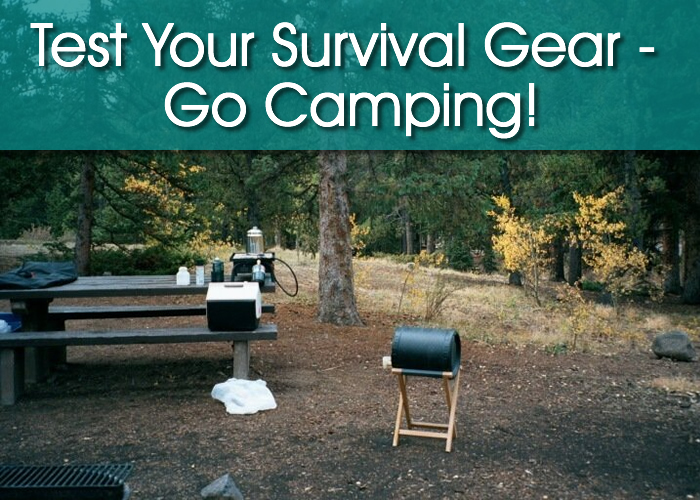 I'm sure you can come up with other survival gear to test while camping — and do test everything. Even if you're not able to go camping, wouldn't it be fun for the kids to test out your equipment just in the backyard? Do it this summer! Getting prepared and practicing is better done NOW than when the crisis is already here.